It’s December 1940 and a Nazi invasion force has landed on the south coast of England. Parabolic Theatre has created a bunker in South London where, assigned new identities as MPs from across the country, we gather when it becomes apparent that London, and indeed the whole of Britain, is in crisis. Under the guidance of Douglas Remington-Hobbes, in another beautifully assured performance for Colab Factory by Peter Dewhurst, we form a new government and try to deal not only with the impending threat but also the rumour of a spy in our midst. Brought together as a house to discuss and vote on matters, then dispatched to work in different areas, such as propaganda or strategy, no two audience members’ experiences will be the same. There is plenty of opportunity to get involved and genuinely shape the course of the evening. The actors apparently have no scripts, and the exact storyline changes every night, so the characters really do respond to what the audience provides them with. Issues of democracy, politics and history are very much at the fore – how will a mostly liberal theatre-going audience in 2018 respond to the questions asked of a 1940s majority Conservative government? How will they work together to reach a consensus? The performances are superb, and the actors manage the action to ensure even the most reticent members of the audience have at least moments of interaction. For fans of immersive theatre, or budding actors, For King and Country gives you at least two hours (and most likely more, depending on how your story takes shape) of truly involving and interactive storytelling. But at times it does start to feel a bit like a RADA audition, with members of the audience making election speeches and arguing over policy for several minutes at a time. While it raises interesting questions and ideas about democracy, groupthink and teamwork, the level of audience participation at times starts to come at the expense of the actual show. This could leave some disappointed. You don’t get much chance to see many of the characters interact much with each other, keeping largely to their separate areas. Also if you’re more reserved it is easy to be overpowered, and thus have much of your evening dictated to you, by more outgoing members of the group. For King and Country is billed as a “gaming style” experience, so it is probably to be expected that you work together and interact more than an average show. But you do feel that overall you hear more from the audience than the actors you have come to see, who are all so excellent they deserve a little more time in the sun. It’s a difficult balance to strike and gives rise to a wider discussion about immersive theatre more generally. But, that being said, the attention to detail and historical accuracy – from the accents to the set to the shillings you exchange your cash for in order to buy your drinks, is superb. 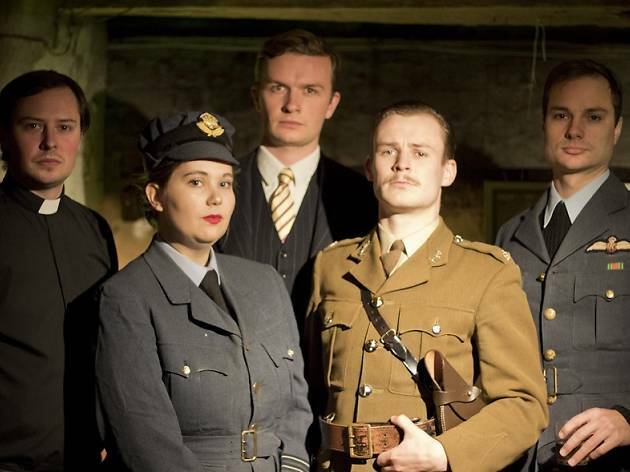 Colab Factory excels at providing unconventional and immersive theatre experiences and For King and Country is no different. In fact, elements of it are so good you wish you got to see a bit more of them. For King and Country runs until 10 June.